Branford, home to 30,000 people in 22 square miles, has easy access to I-95 on the north and twenty miles of beautiful coastline on the south making it a popular destination for busy families looking for a quiet slice of New England charm. The shoreline is known for its scenic neighborhoods that feel like vibrant fishing villages: Indian Neck, Pine Orchard, Stony Creek and Short Beach. Together they contain several yacht clubs, marinas and city parks. Short Beach is home to favorite water view restaurants, and hosts an annual community festival. 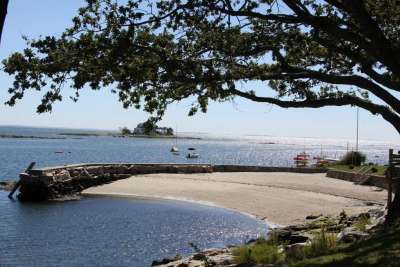 Sight seeing boats launch from Stony Creek to watch harbor seals and tour the Thimble Islands. Branford Center is a picture postcard downtown with 400 years of history. Boutiques and sidewalk cafes circle the Green where people gather to enjoy a summer concert series, the annual Blackstone Library book sale and the winter ice rink. The residential neighborhoods of Branford include six historic districts with countless buildings in the Federal, Arts and Crafts and Queen Anne styles. Many residents enjoy using the Branford Trail which passes through 400 acres of land preserved for public use. Circling the town, it passes by Lake Saltonstall, the shoreline neighborhoods and the Shoreline Trolley Museum, where one can ride on antique trolley cars. But most people appreciate Branford for more modern transportation. The downtown train station takes commuters to Amtrak and Metro-North lines in New Haven, and Tweed New Haven Regional Airport is just three miles away. Branford is known for excellent public schools, and other schools in town include The Children’s Discovery Center of Branford, Shoreline School of Montessori, St. Mary, and Pine Brook.